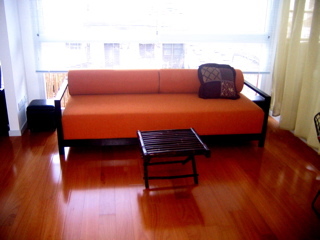 This really nice apartment like loft, is located in Palermo Soho, one of Buenos Aires’ most interesting neighborhoods. The apartment has one big room, wooden floors, large windows, good lighting with a balcony with an open space. Modern design it creates a warm and relaxing atmosphere with a queen-size bed, and big closets in the bedroom area. It has a complete bathroom with bathtub and shower and a fully equipped kitchen. Balcony- Deck-Patio covered . TV Cable ( 30 channells), Internet Hi speed, CD player, cellular phone, A/C, heating system, towels, bed linens. Located in Palermo Soho, you are in one of Buenos Aires’ most interesting neighborhoods. it is also filled with great shopping, sidewalk cafes and tempting restaurants. 2 blocks from Av Santa Fe, where there are several subway stations and bus stops providing access to many other parts of the city. Here, you are also just a few blocks from Plaza Serrano. Included: utilities, basic cellular phone, internet, TV cable, building taxes are paid by owner.